Hello everyone! After a summer of resignations and retirements, I finally have a chance to write a much overdue blog post. 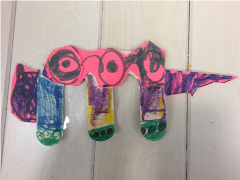 Today I'm going to be talking about our "Letter of the Week" we offered over the past year. 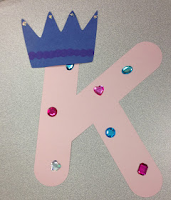 We got the majority of our letter ideas from the amazing No Time For Flash Cards website. We went through the entire alphabet, while changing the letter every Monday. We updated our bulletin board each week with new, easy to recognize items that also started with the same letter. Having kids run into the room to see what the new letter was each week was a really fun experience at the desk. We had a great college assistant who prepped our craft each week. 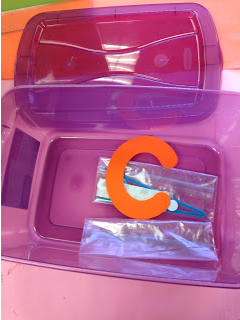 She cut out the letters with our Cricut machine, added any supplies we needed in separate plastic baggies (all the pom poms in one, the google eyes in another, etc), and then threw them all in a tub. Since our desk is usually pretty busy, our goal was to make the letters as easy as possible. Staff simply handed a letter to each kid and then reached into the baggies to hand out the necessary supplies. 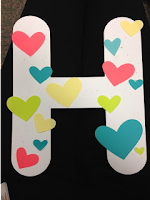 For the first two weeks we had kids trace and cut out their own letters instead of using the Cricut, but after observing we saw that overwhelmingly it was the caregivers doing the letter and cutting. Since we also wanted it to be as non-staff intensive as possible, taking away the scissors was appreciated by all. I know scissor usage is a great skill for littles to practice, but it wasn't feasible with our staffing. 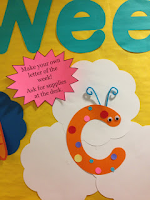 I made sure to include weekly literacy tips on the "craft table" that talked all about letters, scissor usage, etc. The weekly activity started out with low participation and a lot of resistance from the staff (which could have had a direct correlation on participation). Some people thought it was too time consuming. 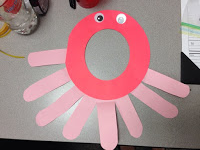 Others thought that kids and caregivers just were not interested in doing a weekly craft at the library. I compromised that if patrons still were not interested by week 4, then I would come up with a different passive program. Luckily, I didn't hear a single complaint after week 3! We soon had patrons coming in every week specifically to do the letter of the week craft. 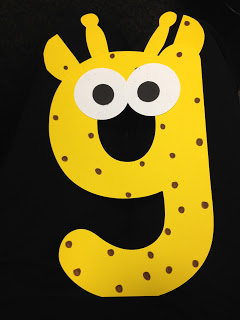 Caregivers told me they were making scrap books at home of the letters, and even creating their own letter themed weeks depending on where we were in the alphabet. After the letter K, we consistently averaged over 50 kids a week. For a passive program, that required very little staff time, this was definitely a win in our book. If you have a volunteer that could prep the supplies each week, then it would be even better! Seeing each unique letter made every day a little better, especially during summer reading craziness. It was a great opportunity for us to talk about process rather than product with the caregivers. One of my hesitations was having an "example" letter each week on the bulletin board. However, we stressed to caregivers to allow the kids do their own thing and that the examples were simply there to remind kids to ask for the letter craft. 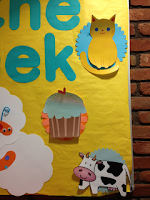 It helped that the "example" was on a bulletin board a good distance from the craft table. Unless caregivers got up to walk 20 feet and checked the bulletin board, they had nothing to compare their child's letter to. 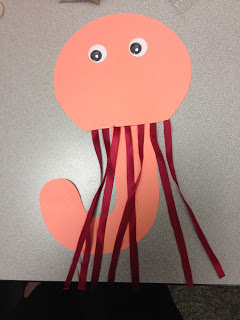 Luckily, caregivers really listened to the staff's prompting and we ended up with some amazing creations! If you're looking for an easy passive idea to run (for 26 weeks!) then this is a great one. You could even leave each letter up for 2 weeks and end up with an entire year of passive crafting! We used supplies we already had in the library, with a few exceptions. In total, we spent under $20, for 26 weeks of programming that ended up with 850 participants. That's under 3 cents a craft!